For those who spend many hours in front of the computer, good posture is essential to avoid chronic back problems and joint pain. Keeping a good posture at the computer means respecting the normal curves of the spine. This can be easily achieved by using an ergonomic chair. The KomfortChair forces the spine and back muscles to observe a proper posture to prevent pain and muscle fatigue. First, find the correct balance for your back. The usual advice to keep your back straight is not enough. To find your proper posture you must sit on the chair and look straight ahead until you feel that your back is balanced and supports itself, without leaning on the back rest. Try to find the same natural position that your back takes while you are standing. After you have found your balance, bring the cushion on the back rest towards you until it touches your back. The unique cushion is freely adjustable and will remind you how to sit properly during your time at the office. Check occasionally that your abdomen is relaxed and the chest still open in order to encourage better breathing and blood circulation. It is important to adjust the chair by changing its height, the seat back position and tilt, until you find the right parameters to suit your body size. You can choose to rest your feet on the floor or set your Komfort Chair to its Ergonomic Mode and take advantage of its comfortable knee-rest support. Do not cross your legs as this can cause posture-related problems. Sit close to your keyboard by positioning it directly in front of your body. Consider using wrist rest devices for keyboard and mouse; they will help you to maintain neutral postures and avoid fatigue and shoulder pain. Place the phone and other devices you might want to use within easy reach. Adjust the monitor and place it in front of you so that your neck is in a neutral and relaxed position. The top of the monitor should be approximately 6cm above your eye level. If you use progressive lenses lower the monitor until you can read comfortably. If you are using a laptop we recommend that you to connect it to an external monitor in order to set the screen to a proper eye level. Alternatively, you can also use an external keyboard which enables you to place your notebook higher and still keep your hands in a lower and correct position. Take a short break every 20-30 minutes. After working for an hour, change the task for at least five or ten minutes to improve your attention and focus ability. Never have your lunch or meals at the computer. 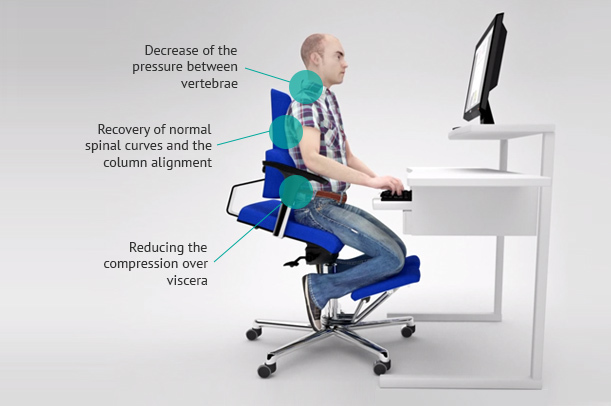 The KomfortChair was created to improve and correct the posture of people who spend many hours at the computer. It was designed to support the back area and to avoid neck and shoulder pain. Try it today and you will realize how work can be less tiring and more productive.